While of course tweets will be forever archived and searchable, Twitter has a very strong of-the-moment nature. When you check your timeline, you see the most recent tweets from friends. Anything that’s older than a certain time is going to be overlooked. When I come across a link to a blog post in my timeline, I feel compelled to click on it now because there’s no built-in mechanism for coming back to it later. My email inbox and RSS feeds will wait until I’m ready. It’s enough of a battle to keep up with everyone’s witty comments and hilarious links, but now even full-length blog posts are thrown into the mix. Twitter is for short and sweet messages — you don’t check your timeline with the intention of cozying up to a half hour of blog reading. And it shouldn’t be. Twitter is for quick tidbits, all of a similar nature. RSS feeds come in from all over the web, and most users have them categorized in their favorite reader. Twitter is for personal correspondence or retweeting interesting tidbits. Link dumps, like RSS feeds, have no personality — why should I follow one? I can’t reply to it, and it won’t write to me, so why bother? Corporate blogs should use Twitter to reach out to their audience and humanize themselves. This one has a bit of crossover with points 2 and 3. I’ve got my online reading routine, and I want to consume content in a particular way. Tweeting links forces me out of this routine, but not in a way where I can still manage things. 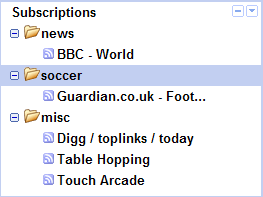 I’ve got my blog posts and news in my RSS feeds and I’d like them to stay there, thankyouverymuch. I know you just made a killer post, and I’ll read it — when I get to my RSS feeds. Use Twitter as a reminder of your blog or to highlight really special posts. Tweet about one post a week, or maybe one a day if you’re really high-volume. Or as, @Gadling does, time-shift selected posts — chances are, if a reader skips over an RSS item from 7am, they may just catch that 6pm tweet. It has always been inevitable that Twitter would be used for spam, and perhaps what’s most discouraging is that it’s the useful sites like Tweetgrid that make gathering usernames so easy. All a spammer needs to do is search for a couple key words related to their product, and then send links to those users. Such a process can be, and already is, easily automated in real time. An example struck me today. While the Premier League can’t seem to grasp the marketing potential of Twitter and the web in general, the nefarious UK betting sites are all over it. One cannot mention the name of a club without finding a couple “so-and-so is now following you on Twitter” emails in the inbox shortly thereafter. Today I tried tweeting about a match using alternative names, referring to Chelsea as Chelski (quite original, I know), but even so I was immediately pounced upon by a site called ChelskiBet. Sure enough, the account had a low followers/following ratio and all of its messages were links to a betting site. How useful can Twitter be if people have to resort to alternative wording to avoid spam? Tweeting “just got tickets for the Y@nkeez game” is not only quite annoying, but it also makes search and discovery difficult for legitimate users. It is also, as I found out, an uphill battle as spammers simply catch on and adapt. Should Twitter start using Gmail-like filtering for spam?